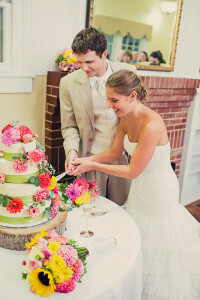 LOOKING FOR THE PERFECT WEDDING RECEPTION LOCATION IN RALEIGH NC? Consistently voted one of the best wedding venues in the Raleigh, NC area, the Rand-Bryan House offers a wide variety of wedding reception options for small, intimate groups to parties of 200 or more. Built in 1871 and restored to its original beauty using old-world craftsmanship and dazzling finishes, the Rand-Bryan House has served as a wedding ceremony and reception venue for some of Raleigh, NC’s most particular brides. When you rent our venue for a wedding ceremony and reception, you’ll get full use of the house and grounds, plus parking for the event, as well as additional time for bridal portraits or engagement picture sessions and the rehearsal. Tables and chairs are available for rental for a nominal fee. Facility rates vary based on the time of year, day of the week, and number of hours the facility is needed. For wedding receptions, up to 150 guests can be accommodated by the house and porch, depending on set-up of tables and chairs. The sunroom and reception room, complete with tables and chairs, can also be reserved. A beautiful dining room is available for your catering needs. Our venue is suitable for casual events including picnics all the way to the most elegant sit down dinners. Our beautiful facility offers an unlimited number of possibilities for nearly any sized wedding ceremony and reception, utilizing the front lawn or the landscaped side yard, which can accommodate up to 250 guests with tables and chairs. Tenting of the site can be arranged. Please contact us today at (919) 995-1663 or online for more information on how we can help you make your wedding reception as unique and unforgettable as you are!